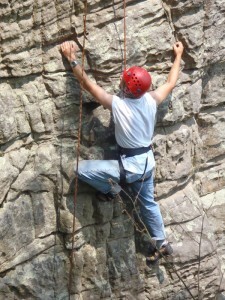 Tennessee State Parks has two climbing workshops a year at Fall Creek Falls State Park. One in the Spring and the other in the Fall. Ranger Ray Cutcher will instruction in safety, the use of climbing/rappel gear and give instruction on climbing techniques. A waiver form must be filled out for each individual (anyone under the age of 18 must have a parent or guardian sign, all children under 16 must be accompanied by an adult). Climbing harnesses, shoes, hardware, helmets and ropes will be provided for the workshop to those who do not have climbing gear. Any person can use their own gear if they prefer. Ranger Cutcher may wish to inspect anyone’s personal gear prior to any climb or rappel. *All participants will need to provide their own transportation for the weekend. Need a place to stay for the weekend. Be sure to make arrangements to get a campsite, to reserve a room at the Inn or a cabin. Campsites must be reserved. Get information here. There are alternative places to stay outside the park. This is a weekend event. The workshop starts on Friday evening of the designated weekend and ends on the following Sunday. Friday – Meet at 7 pm (CST) – Participants will meet and greet in the Gilbert Gall Room, located in the Village Area of the park. Here is a Google map. The evening will consist of introductions, climbing video and hands-on with the knots used in this sport, as well as an overview of belay technique. Get Directions: Google map – type in your address to get directions to the Village Area. The Gilbert Gall Room is located in the green building near the water fountain.